In the 1970s, good design became federal policy. The federal government doesn’t stray too far from a few familiar topics when it comes to its agenda: the economy, health care, national defense, immigration, reproductive rights. But for roughly a decade not long ago, good graphic design was a national priority–and the story of how it became one is a forgotten chapter of design history. In the 1970s, federal agencies and departments like the National Park Service, the Environmental Protection Agency, the United States Postal Service, the Department of Transportation, and NASA overhauled their visual identities and communication systems. Suddenly, famous designers like Lella and Massimo Vignelli, corporate identity pioneers Ivan Chermayeff and Tom Geismar, wayfinding guru Lance Wyman, and Raymond Lowey all had an expanded influence at the national level. And they welcomed the challenge. This era of design has been lionized over the past few years; one Kickstarter campaign to reprint the NASA standards manual earned nearly $1 million, sparking a resurgence in vintage standards manuals from the period. Yet while the logos and identities are beloved, there’s an untold story in the architect behind it all–Richard Nixon–and how those decades-old ideas still influence the government today. The unexpected “hero” in this story is none other than Richard Nixon. Federal design fell under the purview of the National Endowment of the Arts, and its evolution is closely tied to the growth of the fledgling agency. In our country, cultural affairs represent an area of under-attention as compared to our technology. By providing dramatically increased support for cultural activities, you may gain increased respect from groups which have hitherto not been favorable to this administration. For an amount of money minuscule in total budget terms, you can demonstrate your commitment to “reordering national priorities” and to emphasizing the quality of life in our society. During his administration, Nixon doubled funding to the NEA. Garment was correct about the return on investment: The 1971 federal budget was $897 billion dollars, making the $40 million NEA budget just 0.04% of spending (today the NEA and NEH comprise 0.02% of spending), but the money made quite an impact. The robustly funded NEA connected government agencies to designers and architects, which brought about projects that enriched cities across the country and internal design changes that made government operations more efficient. Another pivotal Nixon move was appointing Nancy Hanks as chairman of the NEA. She was a powerful and persuasive arts advocate and was instrumental in expanding the NEA’s scale and scope. She turned the agency into a vehicle for redesigning government itself. Hanks turned the agency into a vehicle for redesigning government itself. Hanks, who served from 1969 to 1977, ran with the mandate from Nixon and established the Federal Design Improvement Program in 1972. Most of the agencies told Hanks they wanted better graphics and better offices, so she divided the program into two parts: the Federal Graphics Improvement Program (active from 1972 to 1981) and the Federal Architecture Project (active until 1977). These two game-changing initiatives introduced design en masse to the government. While both good graphics and architecture were emphasized in the ’70s, the focus on visual communication petered out after several years while architecture remained on the presidential agenda under Reagan. But for a few years, under Hanks’s watch, the government’s approach to graphic design underwent a revolution. Forty-five agencies received new identities under Hanks’s Federal Graphics Improvement Program. They included now-ubiquitous symbols of government and infrastructure, like the NASA visual identity by Danne & Blackburn, the Department of Transportation symbols by the AIGA, the U.S. Postal Service logo, and the standardization of federal highway signs. To publicize what design could do for agencies, the NEA hosted four conferences it called “Design Assemblies.” Over 1,000 designers and bureaucrats participated in the first assembly, in 1973. The same year, Chermayeff edited Design Necessity, a compendium about federally initiated visual communications, landscape architecture, industrial design, interior design, and architecture projects, intended to underscore how design could improve government. The book highlighted projects like the National Park “Minifolders,” which reduced the size of brochures and clarified their formatting; the Internal Revenue Service’s graphics program, which helped recruit new employees and clarify the taxpaying process through redesigned forms and instructional booklets; and the United States Postal Service’s graphics standards manual (and its Raymond Lowey-designed eagle emblem). While designers had a powerful champion in Washington in Nancy Hanks, and bureaucrats had orders from the president to take design seriously, those who responded to this call had their work cut out for them. Getting any project off the ground was a fragmented process that wholly depended on individual agencies–not to mention convincing officials about new ideas and unconventional solutions. The government’s design problems often had to do with scale–how to make large operations, frequently spread across many offices and states, more efficient; how to communicate information to millions of people; and how to use visuals to clearly underscore its mission. It turned out the government’s problems weren’t all that different from non-governmental clients. When the Environmental Protection Agency began working with Chermayeff & Geismar in 1977, it was eager to trim fat from its publications budget. The agency was spending millions on brochures, some of which were unnecessarily elaborate and were all designed from scratch. Additionally, the EPA only used a symbol for its logo–but the graphic designers added a wordmark, since the agency’s initials were widely recognized and used. The National Park Service was facing a similar challenge in 1977, when it hired Vignelli Associates to streamline its printed brochures, pamphlets, maps, and posters, and develop a consistent approach to visual communications. Vignelli developed a device that would eventually be called the Unigrid System. It introduced modularity to the NPS’s materials, so that every designer across the agency would know where to place copy and images. It’s still in use today. One of the most influential systems to emerge from the era was the Department of Transportation’s Symbol Signs from 1974, which standardized pictograms for objects like elevators, stairs, mail, and telephones. “That happened because of someone at the Department of Transportation became frightened when there was a movement to adopt an international system he recognized as being terrible,” Geismar says. “So he talked to the AIGA and Industrial Designers Society.” Geismar chaired a committee fellow designers Seymour Chwast, Massimo Vignelli, John Lees, and Rudolph de Harak to figure out how to approach the system, which was eventually designed by Roger Cook and Don Shanosky. It, too, is still in use today. For the most part, the experiences were positive–but there were tensions, as well. While the designers behind this nationwide movement were able to introduce visual consistency, clarify communication, and save money, the process was often fraught with challenges: agencies that weren’t interested in redesigns, officials who weren’t engaged, and bureaucrats who questioned the solutions. However, since the organization was really 11 discrete, autonomous centers, they resented a doctrine coming from D.C. There was also tension about changing the logo. NASA’s employees hated the redesign. Danne, who, with Blackburn, also designed for the Federal Aviation Administration, the United States Army Corps of Engineers, and the Civil Service Administration, also recalls some agency heads as being disengaged in the process, ultimately leading to projects that were doomed to fail. However, some were more faithful to the programs they created. “The Corp of Engineers toed the line completely and honored both the scope and details of the program, but that’s not too surprising as it’s a quasi-military organization,” he says. Wyman’s work for the government in the ’70s included wayfinding systems for the National Zoo and the National Mall. However, he had his work cut out for him when it came to disproving a stereotype that icon-based wayfinding was “a system that was for illiterates,” he says. While the National Zoo embraced this system of pictorial maps, the National Mall’s new wayfinding was more complicated since it involved many more stakeholders, some of whom were skeptical. Icons are the lingua franca of design today, but in the ’70s, they were still an emerging device. “People didn’t take it so naturally back then, and you had to break your neck a little and you had to go around things like the ‘illiterates’ stereotype,” he says. The ’70s birthed some of the most respected governmental identity systems, and a number of the design industry’s greats helped to create them. But was this governmental graphic design’s golden age? Geismar is skeptical of the designation. “Awareness of design and what design brought to them was certainly something new and something that sort of caught on and became reasonably widespread throughout the government,” he says. “And all those people, like everyone else, had pride in what they and their organizations were doing. Whether it’s designated a ‘golden age,’ I don’t know.” He thinks that some of the contemporary interest in the visual identities has more to do with nostalgia for the cultural relevance of the organizations, which could be true. Designs from the era weren’t universally loved at the time. 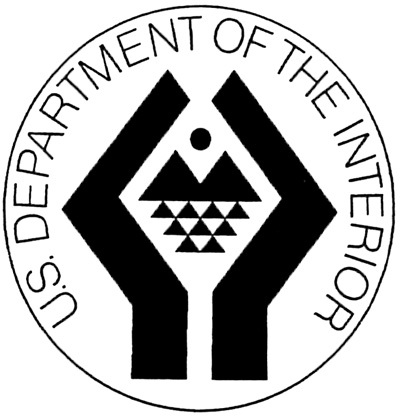 NASA famously reverted back to the “meatball” logo that preceded Danne and Blackburn’s “worm.” In the ’60s, Chermayeff and Geismar redesigned the Department of the Interiors’ logo when the head was interested in changing the agency’s name to the “Department of Conservation,” but the seal–which looked like two hands embracing an abstract landscape–received a cold reception from the agency’s employees, so it was short lived. As administrations change, graphics likely do too. And since graphics are more ephemeral than, say, architecture, they’re easy to switch up. “Frankly, I am more impressed by the WPA and National Recovery Agency for design consistency,” critic Steven Heller told Co.Design over email. When Wyman looks back at the federal design work he created throughout his career, he also holds his USIA projects in high regard. In 1966 he, along with George Nelson, designed the logo and graphics for the USIA’s exhibition on industrial design. But he says the ’70s “probably was” federal graphic design’s golden age. “I’m not aware of anything that has come out so forcefully as [work from] the ’70s,” he says. Could There Be Another Design Renaissance In Government? Some of the identity systems developed in the ’70s are still in use, and some were retooled–a natural consequence of changing political administrations and leadership. The real legacy of this era might not lie in the design itself, but rather in the processes design initiated, and the ambitions they represented. Right now, one of the biggest opportunities for graphic designers is the government’s presence online. The Obama administration made this a priority and established the United States Digital Service to help fix the federal government’s outdated and dysfunctional websites, but the work is slow going–and sorely needed. “To me, that’s where the real energy is on good governmental graphic design,” Schupbach says. The current administration has been silent about what to do with the government’s websites. If it chose to set a strong example, it could usher in another governmental design renaissance. A crappy website is a crappy website no matter what your political affiliation might be. By building upon the history of federally initiated graphic design in the ’70s, any political leader could potentially spur another golden age of government design. There’s absolutely no reason why “good design” should be confined to the history books.